On the night of July 9, 1777, a young Rhode Island militia officer named William Barton and a small raiding party slipped through British defenses on the Portsmouth shore and carried away General Richard Prescott—wearing nothing but his nightclothes. Colonel Barton was second-in-command of the fort at Tiverton Heights, a small foothold against the British forces that occupied Aquidneck Island across the Sakonnet River. 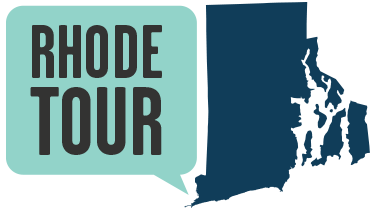 That spring, Rhode Island’s General Assembly declared it a disgrace that no attack ``hath, as yet, been made against the enemy.’’ The assembly set bounties on the capture of British soldiers, from $20 for a private to $1,000 for a general. Barton opted to go after the big prize, the officer in charge of 4,000 British and Hessian soldiers occupying Newport. His plan was so bold that it bordered on foolishness. Besides the troops under his command, Prescott was on an island, protected by a squadron of warships. On July 3, Barton asked the regiment at Tiverton Heights to undertake a hazardous mission. According to lore, every man stepped forward. He selected forty strong rowers, including Thomas Austin, who carried the scars of 300 lashes on his back, ordered by Prescott after Austin refused the use of his oxen to haul British cannon. On July 4, 1777, they launched three whaleboats into the Sakonnet for a roundabout trip across Mount Hope and Narragansett Bays before doubling back toward Portsmouth, their oars muffled with sheepskin. They rowed between two British warships, passing so near to one of them that the oarsmen could hear the watch on deck calling out the time. Finally, the boats crunched ashore at Portsmouth. The men’s feet smudged the dew in the fields as they hiked to the farmhouse of Mr. Overing, where Prescott spent his nights, crossing a creek then cutting through the edge of an orchard hoping to avoid detection. Led by African-American Guy Watson, who may have been Barton’s slave, the men kicked in the door and stormed into Prescott's chambers. The raiders led the partially-clothed general back across the fields, sat him in a whale boat and rowed him across the bay. The daring raid had succeeded. The General Assembly made good on its $1,000 reward, a prize that Barton divided among his men. Continental Congress voted to present him “an elegant sword,” even though Barton wrote that he preferred cash. The sword is now in the collection of the Rhode Island Historical Society. The fortification at Tiverton Heights now bears his name, Fort Barton. Even British Lt. Frederick Mackenzie gave grudging respect to Barton and his men for pulling off the capture: "The Rebels certainly run a great risk in making this attempt. They however executed it in a masterly manner, and deserve credit for the attempt. It is certainly a most extraordinary circumstance, that a General Commanding a body of 4,000 men, encamped on an Island surrounded by a Squadron of Ships of War, should be carried off from his quarters in the night by a small party of the Enemy from without, & without a Shot being fired." 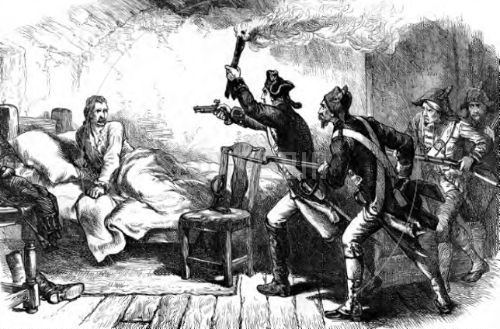 The Capture of General Prescott: While the capture of General Prescott had relatively little strategic impact on the Revolution, the daring raid boosted American morale and caused a stir in England. ~ Source: "History of the United States," by Edmund Ollier, Volume 2 (London: Cassell Petter and Galpin, 1880). 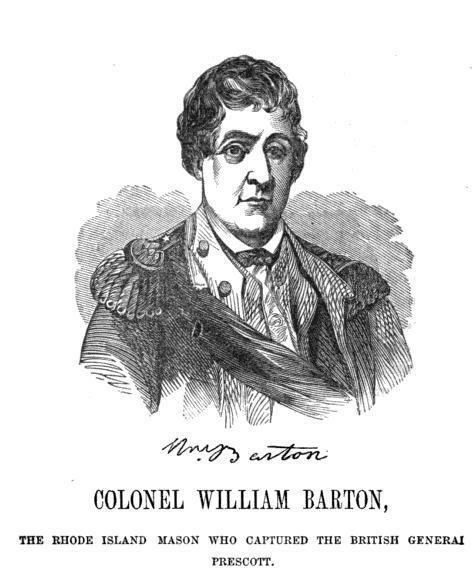 Colonel William Barton : This image of Colonel Barton, from a book celebrating the accomplishments of American members of the Fraternal Order of Masons, is likely drawn more from the the artist's imagination than from reality. ~ Source: "Washington and his Masonic Compeers," by Sidney Haydens (Masonic publishing and manufacturing co., 1866). Gerald Carbone, “Colonel Barton's Raid,” Rhode Tour, accessed April 22, 2019, http://rhodetour.org/items/show/93.